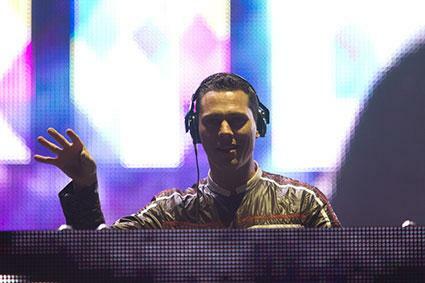 DJing has become immensely popular in recent years, thanks in part to DJs like Tiesto making $22 million a year and others landing on the Billboard charts. As attractive as a DJ career might be, success requires great patience and careful planning as if you were starting a small business. There are two paths you can take in purchasing DJ gear: the old-school set-up with turntables or CD decks, or an all-digital set-up through a computer. It is not necessary to be an expert in both. When you're starting out, choose the set-up that most appeals to you and that you can afford. For beginners who own a laptop, computer software is the least expensive route. Two decks - either turntables, CD decks, or digital decks - from where you play your music. Having two sources allows you to smoothly fade a song out as you fade the next one in. The two decks each connect to a mixer. Mixer that receives the signals from the two decks. This is where you fade songs in and out and conduct any other mixing functions for your set. After receiving the audio signals from the two decks, the mixer sends them into the amplifier. Amplifier that provides power for the signal to be output to speakers. House speakers that receive the signal from the amplifier and play to your venue. Monitor speakers that face you so that you can hear your mix and make adjustments as necessary. Headphones so that you can listen to the next song as you cue it up and prepare to fade it in. Microphone so that you can speak, sing, rap, or do whatever you wish to do at any given moment during your set. Make sure to check your local music store for used equipment as this is often the best way for DJs to build their equipment inventory. Computer with digital song files and installed DJ software. Audio interface that will take the digital audio signal from your computer and send it to the amplifier, which then sends it to your house speakers. A controller that is designed to help operate DJ software. Otherwise, you will have to use your computer's keyboard and learn keyboard shortcuts to effectively use a DJ program. If you're forced to use your keyboard, a good software choice is Native Instrument's Traktor Audio 2. The same remaining items -- amplifier, house speakers, monitor speakers, headphones, and microphone -- as shown above. Traktor: Native Instrument's line of DJ technology is an industry standard. You can purchase the software for $99 at online retailers for PC and Mac. Virtual DJ: A high-quality free software, you can download Virtual DJ for both PC and Mac. Ableton Live: You can download a free trial version of Ableton Live or buy a basic intro version for $99. After you've connected all of the components, make sure that all of the volumes on your mixer and amplifier are turned down. If you rush to flip everything on, your volume levels might be unintentionally set to a high level and you could blow your system. Electrical overloads do happen, so it is wise to get a warranty plan if your retailer offers one. If you're serious about DJing for a living it's crucial to approach your craft as a business. In this case, practicing your DJing skills would be called product development. The following tips will help you create an outstanding product. Music is always front and center, so take some time to hone your sets. Warm up: It's good practice to warm up the crowd before you bring your best material. Keep the crowd guessing, and try to be creative. Avoid overdoing popular tracks: Don't just be a Top 40 radio station. Be original. Create your own beats and tracks in addition to using popular songs from other artists. You can download royalty free samples or you can create remixes and mashups. Stay in key: This takes a little musicianship, but it's crucial that your songs are in the same key otherwise your sets will sound disjointed. Fortunately, you don't need a music degree to pull this off. Websites like MixedInKey.com can help you out. Use a Variety of Genres: This list of DJ genres and corresponding artists will give you a good range of what's out there but in addition to common club genres, don't be afraid to branch out and try unusual genre mashups. Perhaps you will be the first DJ to successfully mashup Johnny Cash with Dr. Dre. 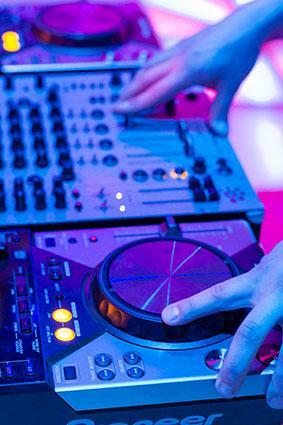 A DJ demo mix is a CD that contains one of your sets so that potential clients can hear your DJ chops. However, keep in mind that it is illegal to sell or distribute copies of any other artist's music without permission and that includes burning your set onto a CD if it is not all-original. For that reason it is essential to create your own beats and tracks, even if just for your demo. Part of being a successful DJ is retraining the way you listen to music. You are no longer a passive fan. You are an artist who is creating your own product. When you're just starting out, it is helpful to record your DJ sets live and listen to them afterwards when you can experience them as someone on the dance floor would. This will help you sharpen your mixing skills. A mashup is when you take two or more separate tracks and combine them into one song. A bootleg is when you take a track from another artist and add in your own content that you've created. An official remix is when an artist has given you their audio files used to create a song and given you permission to remix them however you wish. An unofficial remix is when you've taken an artist's final mix of a song and modified it to create something new, so that it sounds similar to an official remix that was rebuilt from the ground up. It is crucial to be original and creative in your sets and the techniques above are great ways to do that. The general rule of law for DJs is to never sell or distribute recordings of your sets if they contain material from other artists who have not given you permission to sell or distribute it online or in a physical format. However, if you are performing at a club, the law places the burden on the club to pay fees to major licensing companies. This allows DJs to legally perform their sets in clubs regardless of the content. Create your own website with samples and video clips. Start a music blog through an established blogging platform. Use social media strategically as a business would. Be careful to not post any demos online that contain the work of other artists. Become a people person: Bookings often happen informally in social contexts. Don't be shy about promoting your work and giving your demo to potential clients at parties or clubs. Build a professional network: Introduce yourself to other DJs who are working at the kind of venues you're targeting, whether you want to be a wedding DJ or a club DJ for example, and maintain those relationships. Many DJs don't have a problem helping beginners out because they've all been there. Don't be afraid to start small: Even if it means cutting your teeth at local clubs, small-time pubs, or neighborhood parties, you've got to get out there and practice DJing in front of people. Keep an eye on your ultimate goal and aggressively network your way into bigger venues in your area. If your dream is to play the hottest clubs in big cities, look for smaller, similar versions of those venues in your region and use them as stepping stones. Don't offend your clients: One of the worst things you can do is play in two clubs that are competing with one another. Club owners know everything that is going on, and when they find out you've played in their competitor's venue they might not welcome you back. Be aware of your professional environment. As is the case in any profession that involves sales and marketing, persistence is the most important key to success. Don't give up and don't be afraid to keep asking until the door opens. When you're going it alone in a freelance-styled industry, it's vital to join a supportive community where you can get trade tips, make new connections, and just have some friends in the profession who know what you're going through. Registering at sites like DigitalDJTips.com and participating in their forums is an excellent way to get the moral and professional support you need. The ultimate goal of a DJ is two-fold: Keep the music flowing without awkward silences and the party hopping with good song selections. The first goal can be achieved from technical know-how, and that expertise can be absorbed from books or websites. The second goal is a matter of good taste and instinct that can only be shaped and refined by experience. Be patient with yourself, because you'll only be a success if you're in it for the long-haul.